A self-guided walking tour along scenic Route 6 in Victorian Smethport showcases a piece of Americana. Stroll past the Victorian Mansions that line Smethport’s Main Street. Tour the Old Jail Museum and allow time to visit the quaint shops along Main Street. This ¾-mile long trail loops along the banks of Marvin Creek in Hamlin Lake Park in Smethport. Named for the Canadian geese that have frequented the lake, the trail skirts the habitats of many wetland creatures, including water fowl. Access is from the northeastern corner of the Guidance Center/Smethport Wellness Center parking lot. Difficulty level is rated as easy. A system of trails available for hiking, horseback riding, and mountain biking. Many loops can be made, from a short half hour stroll along Sandy Lane to several hours’ worth of vigorous hiking on the North Trail. Begin at the main trailhead, located on Rt. 46 north, 1.1 miles from the PA 6 intersection, on the left side by the gate. Maps are available at the trailhead. Difficulty level is rated easy to moderate. 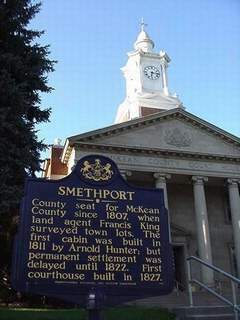 Use the digital map on your smart phone to take a self-guided tour of Smethport. Stream the info directly into your Android device or download it for use in areas with poor data coverage. The app is FREE – just sign in with your Google account. Get the app right now!